This three bedroom, two bath cabin-style home is in a great location between Dillard, Georgia and Highlands, North Carolina. Only 15 minutes from either town, this vacation home is also just five minutes from Sky Valley Golf Resort. 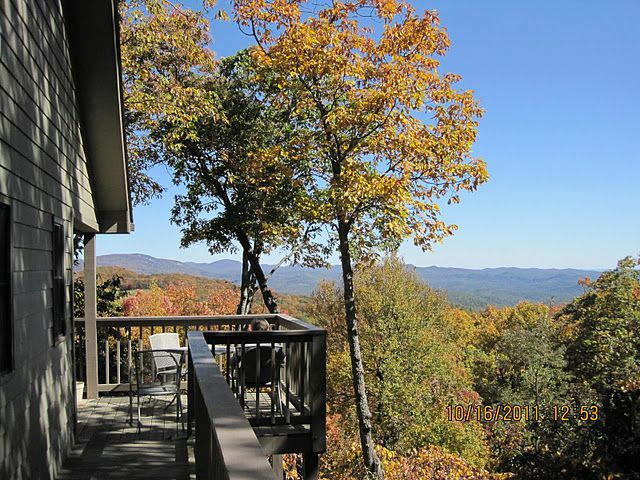 Perched on two acres, at a cool comfortable 3900 foot elevation, above beautiful Blue Valley. (ELEVATION is the key to being comfortable in the mountains in the summer.) The cabin features breathtaking 150° long range views and spectacular sunrises. Weather permitting, the lights of Greenville, South Carolina, some 80 miles away, can be seen at night. You won't have to hike or drive to a spectacular view - it's right there on your deck. The fully-equipped home is designed to sleep six in comfort. Great views from every room in the house. Plenty of windows and French doors keep the house light and airy. Natural oak floors, maple cabinetry, pine ceilings and trim give it a warm cabin feel. We think you will be very pleased with the furnishings and decor. No Smoking Inside, No pets allowed. We have been visiting the mountains every chance we had for five or six years, renting homes, cabins and motels. This house was built, located and equipped with those experiences in mind. Our goal is that all of our guests have a comfortable and enjoyable vacation. SEPTEMBER is a great month to get a nice DISCOUNT! If you live in the Southeast this is simply one of the easiest to get to high elevation areas in the mountains. Not only is it the closest but it has the added benefit of being one of the nicest areas in the mountains. Anything that you would find in the mountains you can find right here. The exception being if you want to go snow skiing I would not look at anything south of Maggie Valley. My wife and I looked for over two years for a location and we always came back to this area. It was the standard and it couldn't be beat. It simply offered the most bang for the buck which makes it a great bargain for you in the area. 2 bathrooms total. One upstairs with direct access to the upstairs bedroom and living area (two door access). One large bathroom downstairs with double sinks. Both bathrooms have a combination tub/shower and are well ventilated. (2) Land line with unlimited U.S. calling area and an answering machine. Central heating system w/heat pump and propane back-up. There is a front loader downstairs and it would be highly unlikely not to find detergents. Propane dryer downstairs in the laundry room. There is an efficient wood burning fireplace in the great room. It uses outside air for combustion. Equipped with both glass doors and a firescreen. All towels that would normally be used in the home are provided. DSL with a wireless modem is available. There are two coffee makers in case you might need decaf. I would not buy anything other than food items until you get there. Plenty of everything for six guests. You could probably do just about everything one would want to do in this kitchen! There are plenty of books of all types. Lots of maps and local information. Lots of movies both old and new. (2) Lots of deck area both upstairs and down. Most of it is completely covered. Lots of beautiful golf courses in the area. There is a great public course five minutes away. River Rafting, Hiking Trails & Waterfalls, Trout Fishing, Snow Tubing within a couple miles, Snow sking within a 2 hour drive, Antique Shops, Flea Markets, Excellent Restaurants, Gem Mining, Lakes. Bring a canoe or Kayak and check out Lake Glenville. Lake Rabun and Lake Burton aren't that far away either. You can rent boats on these lakes also. Picnic on an island or swim where the waterfalls enter the lakes. VERY FAVORABLE MONTHLY RATES. June through Sept. 90 day rentals will get the best rate. To get the best monthly rates please contact the owner, Lloyd Hepler@ highlandshome303@gmail.com We normally try to book peak season as weekly rentals Sat. - Sat.. Second week of June through Labor Day. The middle two weeks of October. Peak Season weekends are available if not booked two weeks prior. Contact owner for Monthly rates. Please contact owner directly for best rates.